This suite of courses is for staff and teams who wish to become simulation faculty. The programme runs over a 6 month cycle and is run 4 times a year. It consists of 4 essential courses and 4 further courses which are for those looking to become advanced casino canada faculty or those with specialist interests. The 4 essential courses must be completed with 12 months from starting the programme. The 4 higher level courses should be completed within 24 months of starting the programme. In addition to these formal training opportunities faculty are required to take part in a programme of reflective practise and episodes of debrief of their debrief. For those on the expert programme as well as the courses offered they is a set of requirements in research and debriefing. Further details of the additional requirements for all programmes are available once an individual is enrolled in the programme. This Simulation-based course focuses on cultural awareness and aims to address some of the challenges of cultural differences in healthcare. Through clinical scenarios and workshops you will have the chance to develop your communications skills and improve your knowledge and awareness when caring for patients with differing spiritual needs, who are palliative, and also gain an understanding of eligibility of overseas patients. This course is ideal for all healthcare professionals of any grade. Through clinical scenarios and workshops, you will have the chance to develop decision making, risk assessment and communication skills to support patients be more active and safe on the wards. This course is ideal for physiotherapists and nurses. There is no charge to participants working at Guy’s and St Thomas’ and staff in the Health Education South London (HESL) South London network. Posted in Courses, Postgraduate Training. Raise awareness of the concept of frailty and its importance. Help raise awareness of strategies and support services that will allow for care in the community when appropriate. Raise awareness of the importance of collaborative working especially when a patient has cognitive impairment. Highlight the importance of compassionate care for frail older patients. Stress the importance of involving patients, families and carers in decision making. 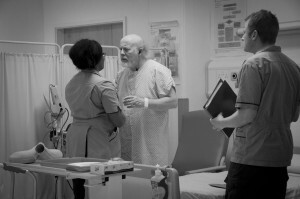 Improve the candidates’ ability to plan a safe and timely discharge as well as follow up, and emphasise its importance. This course has been designed for GP VTS, Medical and Geriatric Registrars, SALT, PT, OT, Band 6 Nurses, CMT trainees, Discharge Coordinators, Community Psychiatry Core Trainees, social workers; foundation, surgical and ortho-geriatric doctors. Sepsis is a major cause of mortality and morbidity within the NHS. The management of sepsis is driven by international evidence and consensus-based guidelines. Unfortunately, the delivery of care to patients diagnosed with sepsis often fails to meet the targets specified by these guidelines, which leads to negative consequences for both the patient and the organisation. The ‘Sepsis 6’ is an intervention designed to improve the immediate management of septic patients by guiding staff through the initial steps in the goal-directed management of sepsis. It has been shown to improve the outcomes of patients with sepsis. Our programme is designed to increase the awareness of the Sepsis 6, to educate about sepsis and to explore scenarios in which the recognition and management of sepsis may be complicated. There is no charge to participants working at Guy’s and St Thomas’, or staff working for NHS organisations in South London or the South London Simulation Network. Admission Avoidance is an interprofessional, one and a half day course for healthcare practitioners working in primary and community care services. It offers the chance to practice in a safe environment the real-life skills needed to communicate and care for potential deteriorating residents in a residential care setting. Please contact the Simulation Team for more information. Full Immersion one day simulation course. The basic surgical skills (BSS) course is strongly recommended for all surgical trainees taking up their first surgical appointment. It is also open to foundation doctors intending to follow a surgical or related career. Trainees take away a course handbook and DVD and, if they successfully complete the assessment, will be issued with certification that is recognised by all four royal surgical colleges. A comprehensive two-day programme created specifically for staff with a role in clinical education and training who wish to enhance their teaching skills in simulation-based education. It forms the start of the faculty development programme at SaIL. The programme provides an interactive mix of theory and practical application of simulation, informed by educational research and best practice. It is also the starting point for novices starting on the SaIL faculty development programme. It needs to be completed prior to further simulation training at SaIL unless a candidate has had exemption from the Director of SaIL. The course is open to Trust employees with a direct role in clinical workforce development and who will be supported to deliver simulation-based education as part of their role. Teams of 2-4 staff from a dept/ ward are encouraged to attend as a group where possible. Students starting the SaIL faculty development programme are able to attend as individuals. Please note we have a high demand for places on this course so please apply early to secure your place. Part one: the course runs over 2 days which are separated by a number of weeks. The course introduces the concepts of structured debriefing, using the diamond debrief model, to facilitate deep reflection, exploration of human factors skills and transfer of learning from simulated experiences to the work place. Part two is the coaching phase: Participants will attend as novice faculty on SaIL courses between the two course dates to practise using the description and analysis phases of the debrief. After Day two of the formal training we encourage participants to further practise the stages of the diamond debrief, debriefing under supervision. The course is open to GSTT employees with a direct role in clinical workforce development. Participants attending this training should only be those currently supported to deliver simulation based education as part of their role or who intend to practise debriefing on a voluntary basis. *There are 12 places available on each date.